1 of 4 Heat oven to 350 degrees F. Coat an 8-inch pie plate with nonstick cooking spray; set aside. 2 of 4 Melt butter in a large nonstick saucepan over medium-high heat. Add mushrooms, broccoli, red pepper and onion to skillet and sprinkle with salt and pepper. Cook, stirring occasionally, for 5 minutes. 3 of 4 Meanwhile, whisk together eggs, sour cream and onion dip. Stir in 1/2 cup of the cheese. 4 of 4 Spread contents of skillet into bottom of prepared pie plate. Pour egg mixture over top and bake at 350 degrees F. for 30 minutes. Remove plate from oven and heat broiler. 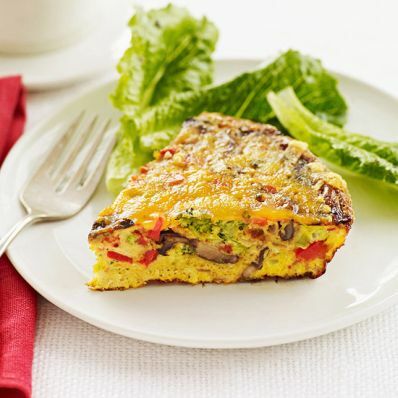 Sprinkle frittata with remaining 1/4 cup shredded cheese; broil 2 minutes or until well browned.